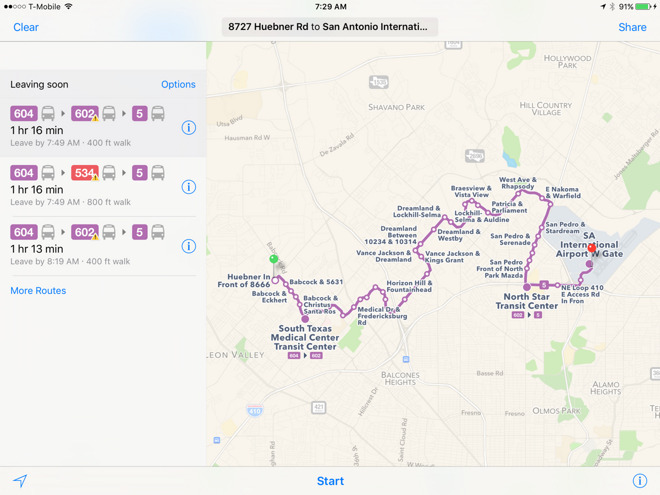 Apple on Monday introduced public transit coverage to two more urban areas in Texas, namely San Antonio and the Dallas-Fort Worth region. San Antonio travelers are limited to taking the city's VIA bus system. In Dallas-Fort Worth, options expand beyond buses to include light rail and streetcars, and even the Skylink "people mover" system at DFW International Airport. 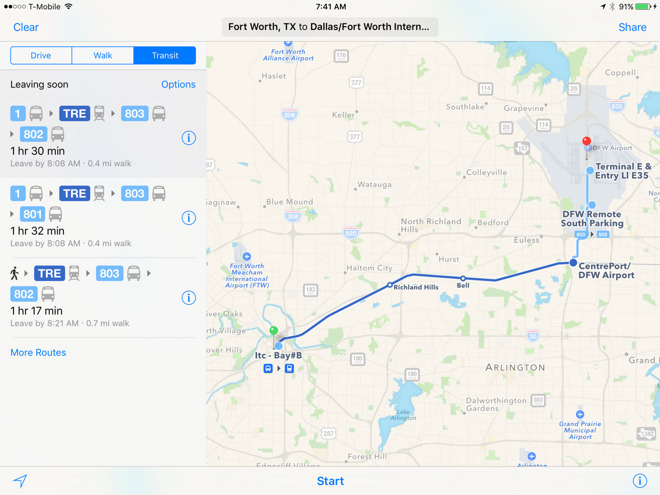 Prior to today, Austin was the only city in Texas with Apple transit directions. The city is home to a major Apple campus, as well as offices for other tech firms like Google, Qualcomm, Samsung, and Facebook. It's also a destination for many tech-oriented visitors, thanks to the city's annual South-by-Southwest festival in March —in 2011, Apple operated a special pop-up store at SXSW to help launch the iPad 2. To date Maps transit coverage has concentrated almost exclusively on the U.S. and China. Even Canada only has a handful of supported cities, and European coverage is about as sparse, limited to London, Berlin, and Prague, as well as other U.K. destinations within reach of National Rail. In the rest of the world, the only cities with transit options are Mexico City, Rio de Janeiro, and Sydney.